The latest Front End Focus (FEF) study underscores the checkout’s crucial contribution to supermarkets — and, for the first time, measures not just sales, but profitability, for magazines and other leading front-end categories. The study is sponsored and overseen by Meredith Corporation’s Time Inc. Retail. 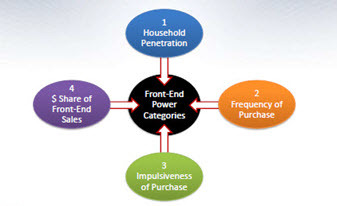 It includes seven elements: detailed checkout space allocation audits of all checkout categories, by lane type, across 19 leading grocery chains; interviews with 1,500 consumers who buy products at grocery front ends; IRI sales performance data for checkout categories (projected nationally); Willard Bishop Super Study 2016 data (delivered in 2017); Nielsen total grocery class-of-trade department data for checkout categories plus rest-of-store categories; in-store observation conducted by Video Mining; and mobile eye tracking in conjunction with Indiana University. Dechert-Hampe & Co. was an analytical contributor. The front end continues to be essential to supermarkets’ sales, growth and profitability. It’s the store area that nearly every shopper passes, even with the advent of mobile checkout options. And it’s the prime location for impulse sales of snacks, beverages and time-sensitive products. The front end delivers nearly 1% of total store sales (0.9%) — $5.3 billion in 2016, according to IRI data — and 1.04% of store profits. The front end is also realizing higher sales growth than total store: up 3% over the last two years, versus 2.3% for total store. Three “Power Categories” — confectionary, beverages, and magazines — generate more than 81% of front-end checkout sales and 86% of the front end’s true profits. The true profit metrics used in this year’s study — a model fueled by the Willard Bishop Super Study — take into account sales, all activity-based costs (warehousing and receiving, transportation and loading, inventory, store occupancy, direct and indirect labor, and shelf facing and stocking); plus adjusted cost of goods, slotting fees, the various performance-based trade funds, and the value of scan-based trading (SBT). While it’s well established that sales performance alone isn’t adequate input for determining front-end space allocations, the objective was to take the metrics to the next level for retailers, to document which categories actually contribute to checkout profitability, and which don’t, reports Bill Dusek, managing director at Dechert-Hampe. While some retailers still argue that certain items need to be at checkout for customer convenience, there is growing recognition that, today, every square inch of retail space must be profitable to be able to compete effectively with other brick-and-mortar and online retailers, he adds. Looking at the front-end Power Categories, the display space allotted to the magazine category is quite close to optimal level, based on its contribution to true profits. However, the beverages category is significantly under-spaced. And within confectionery, candy is significantly over-spaced, and gum and mints are somewhat over-spaced. 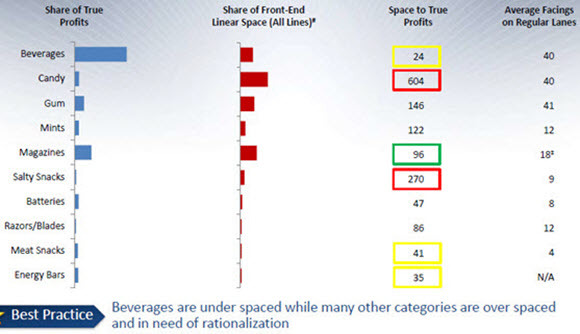 Looking more closely at space allocations, the FEF study’s TIR Retail Audits found that, across all lanes, confectionary products account for 45% of front-end space, while magazines and beverages account for 28% (16% and 12%, respectively). In regular lanes (which account for 58% of total lanes, followed by express lanes at 28.5% and self-checkout lanes at 13.3%), confectionery items account for 47% of front-end space, while magazines and beverages account for 25% (16% and 9%, respectively). 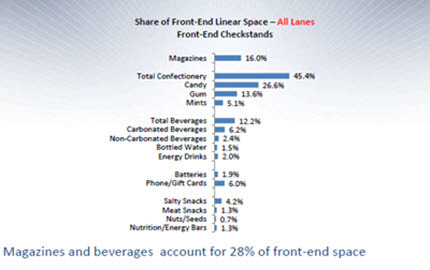 And in express lanes, confectionery has 44% of the space, and magazines and beverages 27% (14% and 12%, respectively). The study’s consumer survey revealed important nuances about supermarket shoppers’ attitudes, preferences and behaviors relating to the front end. As with all parts of the store, retailers are continually evolving the checkout in response to the consumer- and technology-driven trends transforming the industry. Forces changing the front end, specifically, include emerging categories, the need for speed-to-market with new items, more and larger beverage coolers, and experimentation with healthier offerings — plus self-checkouts and mobile checkout/payment systems. Nevertheless, FEF’s survey confirms that a few categories continue to dominate consumption. When it comes to which categories front-end buyers have ever purchased, candy (83%), gum (73%), carbonated beverages (65%), bottled water (58%), salty snacks (56%), mints (56%), non-carbonated beverages (47%) and magazines (43%) are the leaders. Categories in which more than 75% of respondents purchased once a month or more, on average, include magazines, carbonated beverages, bottled water, non-carbonated beverages, and salty snacks. Impulse purchase rates are highest for candy (76%), gum and mints (each 62%) and meat snacks (64%); energy drinks, salty snacks and magazines are in the next rung, at between 43% and 41%. At the same time, one of the study’s key insights (see insights and recommendations sections, below) is that changes in front-end merchandising and promotional activities could enhance impulse purchase rates for key categories. 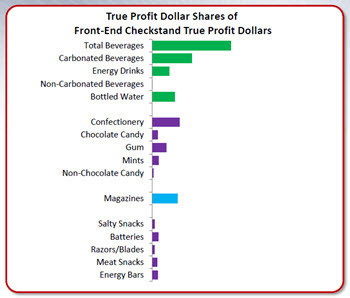 *Again, the checkout Power Categories of beverages, magazines and confectionery generate more than 81% of front-end checkout sales and 86% of the front end’s true profits. Focus on these three categories — and in particular on categories or items that generate higher percentages of their total sales from the checkout (primarily magazines, gum and mints). * Most checkout categories are not growing in step with historical growth rates. Ensure that quality and amount of space is allocated for those categories/items with the highest sales potential. * Implementing the appropriate merchandising strategies for the Power Categories (display positioning and space allocations that are rationalized based on true profit contributions) across all types of lanes is critical to maximizing incremental sales and profitability. * Shoppers spend more time looking at the customer left arm and rear of store (ROS) top tiers when approaching checkout. Make sure that key Power Category items are available in hot-spot areas. *Secondary, temporary displays that block shoppers’ view of primary checkout and end-cap displays depress sales. Find other locations for temporary displays. * Also try new/different merchandising approaches to drive higher conversion rates and increase front-end basket size, and roll out those that work.